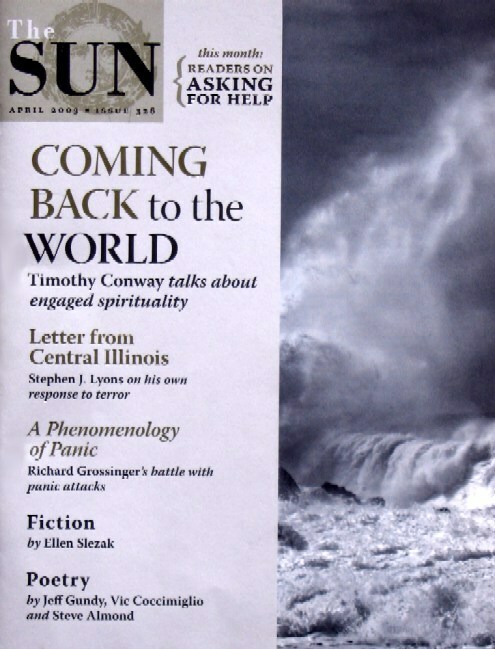 (C) Copyright 2003 by Timothy Conway, Ph.D.
About The Sun magazine: “No other magazine provides quite the same atmosphere of intimacy as The Sun. Along with beautifully written, thoughtful essays and fiction, this publication regularly prints readers' reactions to topics as diverse as smoking and the telephone, mothers and illness. It's a magazine completely unlike any other, always personal, always meaningful, always unexpected.” --Utne Reader on presenting The Sun its "Alternative Press Award for General Excellence"
Introduction by Arnie Cooper: Timothy Conway grew up in the LA entertainment industry—his father was a Hollywood literary agent—but his real passion was sports. Basketball and football were his religion from an early age. When a series of knee injuries took him out of competitive athletics at the age of sixteen, he grew greatly depressed. It didn't help matters that he was reading the existentialists—Camus, Sartre, Kafka—for a high-school literature course. Then, four months before his seventeenth birthday, Conway had an experience that knocked him out of his depression and set him on a different path. "Looking out from my backyard," he writes, "over the San Fernando Valley, near Mulholland Drive, I was flooded with grace and the presence of God." He knew at once "that we are literally made of God’s love and joy." From that moment on, everyone and everything seemed sacred. Having been raised Catholic, Conway considered becoming a priest, but it was difficult for him to reconcile his mystical experiences with the views of Church establishment. Luckily, his high-school math teacher, "a little old Italian Jesuit," was happy to hear him question the conventional belief that human beings are separate from God. "Father Colossimo took me aside one day in the big rectory of Loyola High School and, looking both ways to be sure no non-mystics were in earshot, said, ‘Yes, Timothy, in the mind of man there is separation between man and God. But in the mind of God—’ he paused again to be sure the coast was clear—‘it’s all God!'" Conway began to read the Gospels, visionary Teilhard de Chardin, and the eminent Catholic mystics to help him understand his religious awakening. He ultimately outgrew what he calls the "limited theology" of traditional Roman Catholicism. He also outgrew his conservative view of global politics, opening his mind to the shadow side of U.S. domestic and foreign policy. At the University of California, Santa Cruz, Conway began to explore Eastern philosophy, devouring everything he could find on the Advaita Vedanta tradition and different schools of Buddhism, Taoism, Sufism, and Christian and Jewish mysticism. At the age of twenty, Conway suffered a major loss: the death of his younger sister Kathy. Independent of him, Kathy had also chosen a spiritual path, turning away from a possible modeling career to explore nature, mysticism, and music. Within a few years, she had given away nearly all her possessions and was caring for an old blind man in rural Hawaii. Conway went to visit her there. They hiked to the east side of Haleakala Crater and then down to a campsite on a grassy promontory overlooking the coast, where they spent a day meditating. At midnight, under a full August moon, Kathy, having gone off earlier that evening with some acquaintances, went swimming alone in the ocean below, and a strong riptide apparently took her out to sea. Her body was never found. Kathy's death was heart-wrenching, but it also reinforced for Conway the crucial importance of going deeply into mysticism: the understanding, which he and Kathy shared, that all beings and things are sacred, a manifestation of God. Six years later, in 1980, he spent time as a monk in northern Burma under the Buddhist master Taungpulu Sayadaw. After that, he traveled throughout India as a lay aspirant, meeting many of that country's great spiritual teachers. Conway and I spoke for several hours one morning last fall  in Conway’s Santa Barbara condo, where he lives with his wife and two cats [now three!]. Images of the world's saints and mystics looked down from his walls as our conversation ranged from cutting-edge physics to the television comedy Seinfeld. What struck me most, however, was how calm I felt in Conway's presence. Cooper: In your upcoming book, you say that, in former times, one could get by with just an individual spiritual practice but that in today’s world it’s not enough. Conway: There are two kinds of really powerful, transformative spirituality. One is mystical spirituality or the full, inner awakening from egoism to transpersonal, nondual Awareness. The other is engaged spirituality, working for the public good or collective welfare, out of a deep sense of solidarity with all sentient beings. The problems in the world today are so immense, grievous and dire that we need both kinds of spirituality, not just an individual, inner mystical spirituality. Cooper: You emphasize the need for engaged spirituality in today’s world. Was it not necessary in the past? Conway: For tens of thousands of years, humans lived in nomadic tribal societies and took care of one another, sharing edibles gathered from the forests and grasslands and game from the hunt. Tribes worked together to ensure that everyone had clothing and shelter. To remain viable, tribal societies had to be small. Most comprised twenty to fifty people, perhaps as many as 150 in an unusually large group. Some of the hunter-gatherers who survived into modern times—for instance, the Australian Aborigines and the African San Bush people (who now, sadly, appear to have been extinguished by the encroaching modern world)—still have no private property and cause virtually no environmental damage. They are among the happiest, most loving people on earth. So a distinct form of engaged spirituality wasn’t needed among tribal peoples. They simply took care of each other. With the appearance of agrarian culture some ten thousand years ago and the subsequent rise of the great civilizations, a very different human society emerged. There was division of labor, and societies became stratified into classes. But in a lot of early agrarian societies, people still took care of each other and made sure that virtually everyone was fed, housed, and clothed. As time went on, though, the politics of most societies grew terribly corrupt, which led to great pleasure for the privileged and much misery for the masses. In time, engaged spirituality would be promoted by all the great religions: in the ethic of loving-kindness and generosity among the Buddhists and Hindus, for example, or in the Jewish tradition of tzedek, or “social justice.” And the Christian enactment of agape love. It’s not widely known today, but around the time of Christ, many Jews were Hellenized Jews, people raised in Greco-Roman culture who converted to Judaism in part because of this wonderful idea of tzedek. Judaism offered a more meaningful social and religious experience than the fragmented Hellenistic world of the Mediterranean mystery schools and their remote, often fickle gods. I should mention, though, that engaged spirituality could be found even in the Hellenistic world, among the justice-minded Cynics—Diogenes (400-320 BCE) and his followers. Many New Testament scholars now see Jesus as having been, in some respects, the Jewish equivalent of a Hellenistic Cynic: someone who speaks truth to power, identifies with marginalized persons, and chastises those who would exploit, oppress, or ignore them. Early Christianity made numerous converts because of its “social gospel.” Christians took care of widows, orphans, and destitute persons. When the Roman Empire started to break down, it was the Christian communities that created a welfare safety net, if you will. Later, in the medieval world and beyond, you find Catholic orders trying to improve the lot of the downtrodden, especially in urban areas. Under the social and economic dislocation of colonialism in the Third World and the Industrial Revolution in the developing First World, more and more people began to fall through the cracks. Both colonialism and industrialism spawned horrific social-justice crises. Some of the nineteenth- and twentieth-century Holiness movements in American Christianity, like the Church of the Nazarene and the Salvation Army, emerged in response to these crises and emphasized an engaged social gospel of service and charity. In Asia, Buddhists and Hindus began working more for political, social, and environmental justice in the second half of the twentieth century, and these movements are growing more influential, for instance, saving trees and ecosystems from deforestation and damming, and young girls from the slavery trade in prostitutes. In Latin America, from the 1960s onward, you find the powerfully progressive Liberation Theology movement, based on late-nineteenth-century doctrines from the Vatican that express the explicit “preferential option for the poor” and favor workers in management-labor disputes. The Vatican has enunciated this social gospel of solidarity for more than a hundred years. Cooper: Is the Catholic Church still focused on social justice? Conway: Pope John Paul II, who is so conservative on Church doctrine and lifestyle choices, repeatedly preaches a strongly progressive social gospel of economic justice. Most Americans are unaware of this, because almost all of his economic teachings are censored in the mainstream U.S. press, but just go to the Vatican website or read the newswire reports when he gives a speech. He frequently promotes a very radical economic doctrine: that the goods of the earth were created by God and destined for the good of all, not just for the privileged few. That’s the official Catholic “universal destination of goods” idea, enshrined in the Catechism. In the revised version of the Roman Catholic Catechism, released in 1994, the chapter focusing on the seventh Commandment, “Thou shalt not steal,” goes far beyond telling individuals not to steal; it talks about institutional thievery and corporate mistreatment of workers and the environment. The Catechism implicitly and Pope John Paul II explicitly condemn the International Monetary Fund and the World Bank, which, along with groups like USAID and British AID and all the other “official foreign aid” agencies (not to be confused with wonderful private aid groups like Oxfam, Catholic Charities, Friends Service Committee, and Direct Relief International), form a system designed to exploit poor nations. 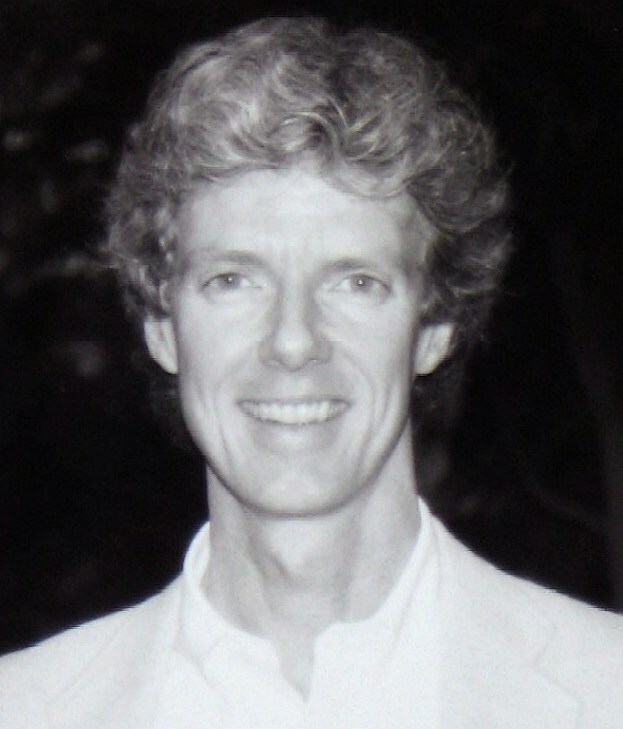 In his famous book The Lords of Poverty, Graham Hancock, former East Africa correspondent for the Economist, lambasted these groups for the most wanton forms of stealing. They are the primary reason why half of humanity toils in poverty, one fourth in dire destitution. Cooper: What are some of the forces taking us in this direction? Do you blame technology? Or do you think it was meant to happen this way? Conway: Fear, greed, ignorance and lack of empathy are the primary forces driving us in this direction. And technology is part of the problem, in that it allows those with the better weapons to prey upon the vulnerable and steal their lands and resources. As for it all being “meant to happen,” from the mystical point of view, the entire human drama is an amazing Divine Comedy, perfectly scripted by the Divine Intelligence. Of course, there’s nothing funny about the world situation. When you consider the fact that nearly a fourth of the world’s population lives on less than a dollar a day, and when you perceive the worsening environmental conditions and the imminent disaster of global warming—with all this going on, you might think the world is just going down the drain. What a tragedy! But in any good comedy there are periods of tragedy, terror, villainy, loss, and anguish before the climax. Then everything changes from being all wrong to all right. In the big metaphysical picture, we 6.2 billion [now 7 billion in 2011] human beings, and countless other nonhuman sentient beings, are being challenged to question the illusion of our egos and awaken from the dream of “me” to our true identity as Divine Spirit. Cooper: And what’s going to lead us to that realization? Conway: Pain, anguish, and a sense of absurdity or meaninglessness often drive us to awaken as a last resort. At a certain point, people find life so intolerable that they reject the traditional conception of an external, “puppet master” Deity. As noted Protestant theologian Paul Tillich said back in the 1950s: when God is up there and we’re down here, we’re under his thumb. As conditions worsen, this rather sadomasochistic view of the deity eventually becomes intolerable. Christianity’s Meister Eckhart 700 years ago urged that we “go beyond god to God.” We must go beyond the dysfunctional theism that puts God up there in the clouds, lording it over us. I would also say that there’s no real solace or ultimate spiritual satisfaction in pantheism, either, which is the idea that God is nothing more than the sum of all aspects of nature. The mature panentheistic view says that God alone IS, the I Am That Am, the Self of all selves. God plays all the parts in the phenomenal drama of existence. Like a single actor moving about on stage to create various characters, God is exploring all kinds of experiences: pleasure, pain, loneliness, popularity, fear, longing, resentment, euphoria. As some saintly Hasidic rabbis courageously stated, God is the Jewish families going off to the ovens in the concentration camps, and God is the Nazis sending them to their deaths. God is the suffering Iraqi children dying of cholera, typhoid, and diarrhea because sanctions have deprived them of clean water and basic medicines, and God is the U.S. State Department and White House officials who keep these murderous sanctions in place. All are guises of the one God. God plays all the possible roles—from enlightened beings to the most unenlightened dictators and death squads. So many different possibilities—and not just human, but also animal, plant, fungal, bacterial. All played by this one Spirit. This nondual view answers the problem that Paul Tillich saw, of all creatures suffering at the whim of an almighty Creator who’s putting them through their paces. No! If you feel pain, this is God’s pain. God is here, experiencing what it’s like to be “you,” experiencing this grievously troubling situation, just as God is experiencing what it’s like to be George W. Bush, or Saddam Hussein, or a cancer patient, or someone who just won the Lotto. What an amazing [truly miraculous, "wondrous"] play of divine creativity and courage and poignancy. Cooper: So what act are we in? How does the play end? Conway: From the mystical view, it doesn’t matter. When you’re living timelessly in the Now—not the nunc fluens, the now that flees, this illusive moment [snapping his fingers] which vanishes every millisecond, but in the nunc stans, the now that stays, God’s eternal Now—the question doesn’t come up. At another level many faiths see existence as a story with a beginning and an end. The ancient Hindus, who have a more cyclic, nonlinear notion of time, divided the human story into different yugas. Supposedly right now we’re in the Kali Yuga, the dark age of environmental ruin, societal breakdown, and hideous abuses. As to when Kali Yuga ends and a more benign era comes, no one really knows. God knows. Cooper: Mystical spirituality has been your main emphasis in your teaching for the past twenty years. Could you explain a little more about it? Conway: Mystical spirituality, as practiced and described in the Eastern and Western sacred traditions, would have us transcend ego and selfishness and discover this Absolute Being-Awareness that stands prior to self, this single Reality underlying everyone and everything. We’re always tested, though, because the ego, which is the Divine dream disguise, can work in subtle, insidious ways. I have found that, in areas where I thought I was ego-free, the ego still shows up: selfish, grasping, judging. We can cut through all of that and return “Home” without any binding attachments or aversions. Most mystical traditions use this metaphor of “the great return” to What we always Are. Mystical spirituality is about coming home to God, our Real Nature. This fulfills the first Commandment of the Torah, as quoted by Jesus: “Love the Lord thy God with thy whole soul, heart, mind, and strength.” The mystical Sufis of Islam speak of passing away or being annihilated in all-consuming remembrance of or return to Allah. The Hindu sages speak of losing the sense of a separate, mortal self and realizing your original identity as the Divine: Tat tvam asi, “That thou art,” or Aham Brahmasmi, “I am Brahman.” Taoist mystics speak of the ultimate return (fu) to one’s primordial nature as Tao. And so on. Engaged spirituality means spontaneously working for the collective welfare out of a deep sense of solidarity with all sentient beings. It also involves inward activity of healing prayer or blessing. It fulfills the second Commandment of the Jewish Torah and Christian Gospels: “Love thy neighbor as thyself.” An equivalent can be found in all other sacred traditions. It’s basically a radical empathy with “the other,” who at that point is no longer other, but a manifestation of the one Self, the nondual divine reality of Spirit. When one is the totality of manifestation—all beings, all forms, all events—how can we not be deeply involved with our human brothers and sisters and all our fellow creatures on the planet? So, while mystical spirituality is about the true “I,” engaged spirituality is very much about the I that is “we.” We need both modes, simultaneously, for a full, balanced, deeply alive spirituality. Cooper: Many people feel a tension between the more contemplative life on the one hand, and the more engaged activist life on the other. Conway: To heal this conflict, I think it helps to see our situation on three levels—all equally true and valid. I’ll start with the most familiar level, level three, the level of our ordinary experience in the world. This is a realm of opposites, of pleasure and pain. In some spiritual literature, you hear a lot about going beyond the opposites, beyond duality, but let’s stop at this level and acknowledge the loss and gain, the beauty and ugliness. This is the level of right and wrong and good and evil. It’s humans doing despicable things to each other and to our ecosystems. It’s also all the good and beauty and joy in the world. Cooper: What about level two? Conway: On this level, we realize that, whatever happens, it’s all perfect. The great fourteenth-century Christian saint Juliana of Norwich was immensely troubled by the misery around her, the sinfulness of people, and the traditional idea that sinners would go to eternal hell. Then she experienced a dazzling revelation: Jesus appeared to her and, among many other lovely utterances, said to her, “All shall be well, and all manner of things shall be well.” And this beautiful secret from God was revealed to her—that all beings would somehow be brought Home. No one would have to permanently suffer in hell, for God is our deepest truth, our real condition of eternal love and bliss. Ramakrishna, the great Bengali master of the nineteenth century, when asked why we suffer, replied: “To add zest to the play.” In classic works of comedy, from Shakespeare to the Marx Brothers, things get darkest before the dawn. And when that dawn comes, when the comedic climax happens, all those on stage awaken to an overwhelming sense of joy and happiness. In the highest form of comedy, even the villains are converted. So here at level two, the deep, mystical part of us realizes that all is well. Unlike our vulnerable human aspect, which fears things are going down the drain, this deep Self knows that, in the exquisite script authored by Divine Intelligence, it’s all perfect and everything happens for a reason. You can take this on faith, but mystics know it in the core of their being as the truth of every situation. Cooper: Many people have trouble even taking it on faith. They want proof. Level one is the deepest mystical truth, namely: Nothing is happening. The world is a dream. There’s only God here. It’s always only been God, changeless and full, whole and complete. A hymn repeatedly found in the ancient Upanishads declares, “Praise to the great Divine Fullness (Purnam),” which remains perfect and changeless despite all that is happening at levels two and three. Because at level one, nothing is happening. What appears to be happening at the other levels is a dream of Consciousness. Sufi saint Hakim Sana`i declared: “You think you are something, but that something is nothing.” La ilaha illah Llah. There is nothing but God. The finest nondual advaita scriptures of India use humor to explain this. Yoga Vasishtha [an early medieval work], for example, playfully states, “The cosmos is like two sons born to a barren woman who did not really exist, and one day they went out and got on their horses that had never been born and traveled along a nonexistent path to an uncreated land to a town that existed only in the imagination.” These advaita scriptures all affirm that the world is a dream-play of the Supreme Consciousness. Yes, a world-appearance is happening that has a relative reality to it, rich with phenomenal experiences—colors, sounds, textures, tastes, smells, bodily pains and pleasures, emotional ups and downs. Yet it’s all a dream. And if you bring attentive awareness to it, and a strong urge to awaken, the dream’s apparent solidity is dissolved. And that’s true for the ego as well, the sense of me, my mind, my body. So here’s the paradox: in Spirit—wide open, vast, spacious, infinite Being-Awareness—the No-thing manifests as “something,” a world of phenomenal entities and processes. But, as the Zen masters say, it’s all sunyata, empty fullness. It’s manifesting as Arnie, as Timothy, as the plants, the walls and all these beings within these walls and beyond, from the microscopic bacteria to fungi, to animals, to life on other planets. The entire play of all these souls is the One sitting where it always sits, spaceless, timeless, conjuring up a dream of multiplicity. Within the heart-mind of God appears this Cosmos-dream, manifesting on subtle levels of refined light, from the heavens all the way down to the denser, gross levels of the physical plane. Wondrous and poignant adventures are happening. God plays all the parts. Conway: Jefferson and Madison saw a dark tendency toward greed, fear, and violence in the human spirit. As an antidote, they chose representative democracy—which was, incidentally, based on the representative government of the Iroquois Six Nations. Later, the Industrial Revolution drove people into an insular, more selfish kind of existence, competing for manufacturing and mercantile jobs. In our era, the so-called service and information economies have disrupted the social fabric and caused an even greater breakdown of the extended family system. More of us are living by ourselves or cohabiting for economic reasons. We’ve been turned into a nation of Lone Rangers, and not by accident. There was an orchestrated attempt back in the early twentieth century to turn people into selfish consumers and alienate them from each other. Communes and voluntary simplicity and other nonconsumerist approaches to living have arisen to counter this, but most people feel more and more separate, more and more out of touch. Modern life continues to discourage solidarity and empathy and promote competition. Look at our economy, which is really a sadistic game of musical chairs. Who’s going to get a job that can actually support a family? Who’s going to get the decent income and benefits that allow one to save money and not go into credit-card debt? We’ve been bamboozled by sloganeering politicians who use demonizing anecdotes about welfare queens to indict single mothers while unfairly rewarding their favorite welfare kings: the big corporate honchos who lavishly fund their servile politicians’ campaigns in return for huge federal subsidies and tax breaks. Hundreds of billions of dollars in corporate welfare are granted annually to the ruinous oil, coal, nuclear, mining, and timber industries, and the corrupt agribusiness, telecommunications, and financial sectors. So, yes, we have a demonocracy ruled by demons—greedy, callous, and conniving. Most of the politicians playing these sordid little games don’t seem to have a conscience anymore. There are still about a hundred people in Congress who are trying to promote the common good. Unfortunately they are heavily outnumbered by these other politicians who are pretty much bought and paid for by special-interest groups and corporate donors. I speak critically of these asura or “demonic” characters, but they need our compassion. Though they appear immersed in very ungodly behavior, these folks are essentially God in disguise. Speaking from the radical context of the one Spirit, I am these people. There is only one Self here. May they and all beings be healed and liberated into full realization of this one Self. Cooper: Let’s talk about the media. You’ve critiqued them for being too conservative, but many analysts contend that the media are still a bastion of liberalism. Conway: Republican Vice President Spiro Agnew first came up with this myth. The truth is that, since the sixties, the media have tended to be liberal on certain social issues and most lifestyle issues. They have largely supported the causes of civil rights and gay rights, and ethnic forms of culture, from jazz to hip-hop. But on too many really important issues—poverty, workers’ rights, wages, war, military spending, corporate misbehavior, tax evasion by the super-rich, universal healthcare, environmental ruination, and the criminal “injustice” system—the corporate-owned media are generally quite conservative and complicit. The media watchdog group Fairness and Accuracy in Reporting has for years carefully documented just how far the mainstream media lean to the right on these important public-policy issues. For instance, most big media outlets have explicitly or implicitly endorsed Republican presidential candidates over the decades. “News analysis” programs almost always feature a debate between extreme right-wingers and pseudo-liberals who lean to the right, with few progressive populists anywhere to be seen. And four out of five “experts” cited by the media on public-policy issues come from richly funded, right-wing, propagandist pseudo-think tanks such as the American Enterprise Institute, the Heritage Foundation, the Hudson Institute, and the right-leaning Cato and Hoover Institutes. Since the Reagan Era, hard-line right-wingers have routinely written our public policy, and Republicans have hastily rammed it into law, with the help of right-leaning Democrats. Meanwhile, the complicit media have refused to give a voice to those who seriously protest these evils. That’s why we’re seeing the alarming loss of species and natural resources, worsening global warming, ever-increasing poverty here and abroad, criminal neglect of America’s and the world’s children on a massive scale, and erasure of our middle class. Corporate executives, elite investors, and free traders are growing richer while everyone else loses their shirts. I sometimes think that if you transported our current media stars—the celebrity news anchors and talk-show hosts—to Nazi Germany in the 1930s, these people would, in the interest of so-called “objective reporting,” allow the Nazis to “have their say” and not give any conscientious protestors the time to lay out their case for human rights. The whole thing would be treated as a big joke, a form of entertainment. Cooper: It seems that entertainment has replaced real reporting. Conway: Yes. Too often the media fall headlong into “anything goes” sensationalist journalism, celebrating outrage and looking for the most bizarre forms of expression. This then drives a cultural process wherein young people or mavericks feel that they can push the envelope even further. Look at what happened to rap music: it started out as a form of social protest, but then was hijacked by some surly characters who, aided and abetted by the corporate music industry and big media, turned it into something violent and degenerate. As someone who appreciates the beauty and power of traditional sacred arts, I’m sometimes rubbed the wrong way by our culture’s ugly forms of music, sculpture, and so on. Cooper: But aren’t traditional notions of beauty elitist? What about those who would say that ugly is beautiful? Conway: There is, in fact, an aspect of Zen which says that whatever happens has a cosmic beauty to it—what the Zen practitioners call “suchness.” Dogen Zenji, the thirteenth-century Japanese Soto Zen founder, said in one of his haiku, “Ah, spring is here. Flowers are blossoming. So are the weeds.” Zen delights in the profane and the mundane and doesn’t distinguish between them and high art. You see this, for instance, in the cartoonish, clownish self-sketches by certain great Zen masters like Hakuin. Yet Zen also has fostered sublime temples and gardens and beautiful arts like the tea ceremony and sacred shakuhachi and koto music. So even the Zen tradition, which most persistently chops down artificial barriers between the mundane and the sacred, has given rise to highly refined sacred arts. The reason I’m still old-fashioned about the arts is that certain sacred arts have an uplifting, refining quality. They expand consciousness and shift it to more subtle realms. The European sage of advaita (nonduality), Jean Klein, often talked about the power of sacred art to awaken people. Pop culture for the most part doesn’t have this power—except, perhaps, by accident. Cooper: Is there no room for pure entertainment? Conway: I don't hold any elitist bias against the profane arts, where people are just having fun, sometimes very bawdy or raucous fun. My wife introduced me to the sitcom Seinfeld, a wonderfully postmodern comedy where everything goes wrong, there is no happy ending, yet “that’s OK” in an odd way. Popular culture can be fun, but when we lose awareness of the sacred arts that celebrate our spiritual origins, when we become hooked on the adrenaline rush that pop culture so relentlessly pushes in its ideal of frenzied euphoria as the acme of human experience, when we get shocked too often by hard-rock music, gangsta rap, and so on, something precious is lost. To use the Indian chakra model, pop culture stimulates only the lower chakras, and that can eventually become more enervating than gratifying. Cooper: You also quote Gandhi in your book: “Those who say that religion has nothing to do with politics do not know what religion means.” What about the separation of church and state? Conway: We need to separate institutional religions from the state, because institutions want more power, more control. They would distort the political process. But our politics can be motivated by the core spiritual beliefs that transcend religious divisions. Many religious leaders are coming to appreciate the value of a spirituality that goes beyond institutional religion. In the early 1960s the Catholic Church’s Second Vatican Council documents openly declare that God is working to save souls in religions outside of Christianity. So, hopefully, humanity is evolving toward a more enlightened, mature spirituality based on panentheism. Of course, for a corrupt political state, engaged spirituality itself is a threat to the status quo. Cooper: Do we even need organized religion? Conway: Certainly. For all its grievous sins, organized religion generates a communal, celebratory power that can inspire us. And it promotes engaged spirituality through charities and social-justice movements and environmental coalitions, like the National Religious Partnership for the Environment. Think, too, of Martin Luther King Jr. and other civil-rights leaders who used the organizational power of the black churches to mobilize so many courageous marchers and demonstrators. In this country there are some 62 million Catholics. Some are ultraconservatives, but a great many tend to be political progressives. Who most opposed Reagan’s and Nixon’s atrocious policies in Latin America? It was primarily Catholic nuns and priests and laity, especially in Latin America itself. Many Catholics in the U.S. are currently fighting to close down the notorious School of the Americas in Fort Benning, Georgia. The SOA—recently renamed the Western Hemisphere Institute for Security Cooperation—is the US Army division that trains, arms, and funds death-squad leaders from Latin America, who, over the last forty years, have slaughtered nearly a million people: peasant farmers, schoolteachers, union organizers, laborers, journalists, priests, and nuns. A Catholic priest, Father Roy Bourgeois—who’s also a highly decorated Vietnam War veteran—has led the movement to shut down this U.S. terrorist training camp. It was Catholics like Dorothy Day, Thomas Merton, Jim Forest, and the Berrigan brothers who spearheaded the religious arm of the antiwar movement in the sixties. The leading Catholic peace activists tended to be mavericks, but they also operated within the channels of the organized Church. That’s how they were able to mobilize so many fellow activists. So, yes, we need separation of church and state to save us from Pat Robertson and Jerry Falwell, and yes, we need a movement toward a more mystical, nondual spirituality. But it’s nice to have institutional religions around to serve as a conspicuous moral conscience for the nation and the world. Cooper: And what about the religions of the East? Conway: Well, the Dalai Lama, who has a lot of clout on the world stage, has been emphasizing an engaged spirituality of action, not just meditation. Hinduism has a reputation for being amorphous and unorganized, but lately many Hindus have realized they need to create religious associations. The Hindu holy woman Ammachi (whom I wrote about at length in the last chapter of Women of Power and Grace) has become a recognized leader within that tradition. A profoundly nondual mystic, she has talked of ending the oppression and exploitation of women, and also of empowering women and men to realize the compassionate way of “universal motherhood” to alleviate the ills of the world. Cooper: Doesn’t religious orthodoxy become a problem with any organized religion? Cooper: What about someone who meditates to reduce stress? Conway: Great. There’s nothing wrong with being stress-free and at peace, but are you realizing genuine peace, or are you trying to achieve peace as something you can show off to your friends? That’s not real peace. It’s an inflated ego posture. Many spiritual aspirants never question this basic ego syndrome that all great spiritual masters invite us to examine. This illusion of being a solid ego in a solid world. We can ask ourselves, “Who or what am I?” We presume a sense of solid self in a solid world that we manipulate and exploit in different ways for getting pleasure and avoiding discomfort. Deep spirituality questions the entire delusion of separate self. Conway: Obsessing about a spiritual practice is better on some level than obsessing about getting money or having a beautiful body. The problem is that people can develop a false conception of enlightenment. They think it’s some special thoughtless state that can be achieved by going to meditation retreats and trying to become ever more contemplative, to reach a permanent state of formless, blissful consciousness. But none of the Eastern masters ever taught this as being the ultimate goal. Nor did Western masters like Saint Francis, who routinely entered deep samadhi states for ten to fourteen hours a day. None of them ever promoted this as the be-all, end-all state. Yes, it might help one to experience the truth that Spirit is all there is. But all authentic spiritual masters teach that one comes back to the world with an eyes-open, nondual view that expresses itself through engaged spirituality. Some people spend vast sums of money on workshops, nutritional supplements, and hi-tech “consciousness altering” gizmos in their quest for spiritual transformation. This money could be better spent helping the poor and victims of injustice. You can support a Tibetan refugee woman or a child at a Mexican orphanage for less than two hundred dollars a year. Many have been conned into spending tens of thousands on corrupt movements like Transcendental Meditation and Scientology. You could easily spend a hundred thousand dollars by the time you’re finished, if there were any finishing it. Such groups will always try to seduce you into paying for the next big experience. They hold this carrot in front of you—some new “state” or new level of initiation—if only you do x, y, and z, and pay through the nose. Too many folks have squandered valuable time and money on practices that were never really recommended by our greatest spiritual masters. The result? These people, so many have noticed, still have closed hearts, unenlightened minds, and big egos. Cooper: So what can we do to avoid this? Conway: Be savvy. For instance, many aspirants believe they need to undergo endless rigorous training to achieve a blank mind. That’s a bogus idea of enlightenment. You aren’t the mind or the body, but the pristine Awareness that transcends and includes both. What the authentic spiritual masters taught is to become, not thoughtless, but thought-free; not emotionless, but emotion-free, intuitively standing in your real Identity as the unborn spiritual Self. That is, we should be free to have our thoughts and emotions and not be had by them. It all comes down to this: Are we content to muddle along in our mediocrity? Or will we awaken to the peace beyond all fathoming, the spiritual freedom from all that binds, and the healing love that embraces all beings in the one Divine Spirit?